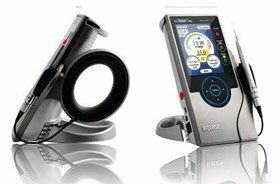 This instrument from the world’s top dental laser manufacturer allows patients, like you, to receive minimally-invasive treatment such as non-surgical gum recontouring with only topical anesthetic. In addition, with Dr. Kuzmin and Dr. Lim utilizing this technology in our dental office, they can be more efficient, saving you time during your visits. Several of our patients appreciate spending less time away from their lives while also feeling more comfortable during and after treatment. In addition, with the Ezlase®, we can give you immediate comfort from ulcers or lesions and create more precise fitting crowns. This translates into fewer office visits to ensure a proper fit than a traditional dental practice. Ask us about the role that Biolase Ezlase may play in your overall care.